The Centre for Science and Environment expresses deep shock at the dubious death tally and massive loss of healthy life years due to illness from growing air pollution in Delhi and the country. Today, the leading medical and public health experts of India came together under the aegis of the Indian Council of Medical Research, Ministry of Health and Family Welfare to release the first ever systematic assessment of burden of disease at both the national and state level in India. The report notes progress in increasing life expectancy across the nation and in all states, although the improvements vary substantially across states. They also warn that air pollution remains the second most important risk factor nationally. Simultaneously, the report of the Lancet Commission on Health and Pollution has looked at the full range of environmental health risks reporting, based on the systematic Global Burden of Disease estimate. This shows that globally, some 9 million deaths occur each year due to air water and chemical exposures. Air pollution is at the top of the list, with outdoor and indoor air pollution contributing the lion's share: some 6 million deaths. India remains one of the worst affected where 1.9 million premature deaths occur due to outdoor and indoor air pollution. This strong evidence makes it clear that comprehensive and long-term strategies for reducing air pollution are critical to protecting public health. At the same time, they note that this is likely an underestimate; there are many exposures for which the data is not yet strong enough to quantify the effects. The medical experts led by the ICMR and IHME have documented the main causes of death and disability over the last quarter century, noting that some causes such as diarrhea and other communicable diseases have declined, but others, especially heart disease—which is closely linked to air pollution and smoking—has increased significantly in the country. When they examined the greatest risk factors for these diseases, especially for their ability to cause loss of healthy years, they found outdoor and indoor air pollution to be the number two risk factor nationwide, surpassed only by continuing impacts of maternal and child nutrition. The average life expectancy has gone up from about 64 years in 1990 to 73 years in 2016 in Delhi. But the quality of life shows significant decline as the overall disease burden in the city has increased. The share of non communicable diseases—which are largely affected by the environmental risk factors, including air pollution—is increasing very rapidly, affecting all age groups. Even though the share of communicable diseases has come down, this benefit has been offset by the dramatic increase in non-communicable diseases. Cardiovascular diseases, chronic respiratory diseases (COPD) and cancers, which are further aggravated by air pollution, have shown dramatic increase since 1990. In 1990, COPD was ranked 13th among leading causes of illness and lost life years. But this has now shot up to rank 3. Similarly, Ischemic heart disease that greatly influenced by air pollution has gone up from rank 5th to 1st; diabetes from rank 22nd to 5th and stroke from rank 16th to 15th. Making mockery of the population dividend, more than 60 per cent of the younger age group in the city (40-69 years) is affected in varying proportion by chronic respiratory disease, cardiovascular disease, and cancers. This age group contributes 41 per cent of total deaths in the city. Ischemic heart disease and lower respiratory infections are the top two leading causes of deaths among men and women. In fact, the GBD has already established that in India more than 50 per cent of the premature deaths, which are triggered by air pollution, are from ischemic heart disease. Another latest study on children released in the Journal of Indian Pediatrics provides powerful evidences of children growing up in polluted environments of Delhi having reduced lung growth compared to the children in developed countries such as the US. Indian children have slower growth of lungs and reach a final size that is lower than that of Caucasian White children in the US. While both Indian and US children have nearly the same size till the age of eight, when the lungs complete their normal physical growth, subsequent growth is different two countries. Both boys and girls have lungs that are about 10 per cent smaller when they become adults in India. This study has been done by Prof SK Chhabra, former Director-Professor at Vallabhbhai Patel Chest Institute and now Head of Department of Pulmonary Medicine, Primus Hospital in New Delhi. The study highlights that air quality and childhood infections influence lung growth besides genetic factors. 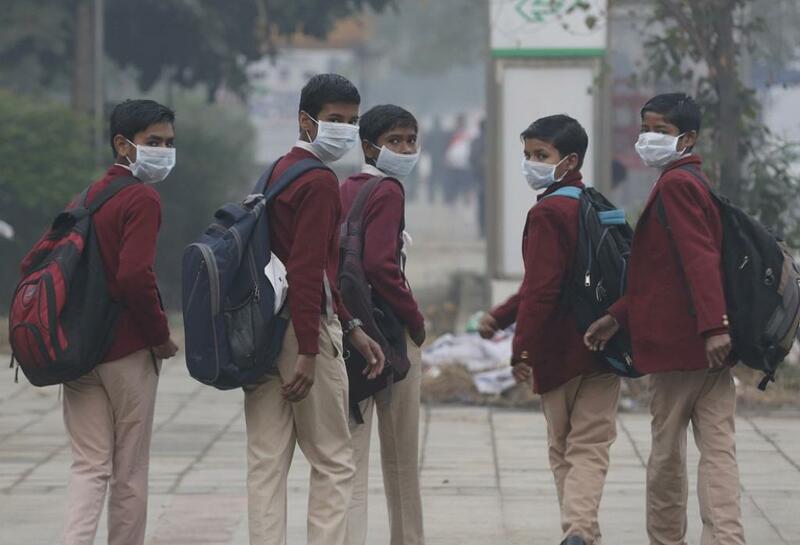 Air pollution retards lung growth in Delhi children. Even Indian adults have smaller lungs than their US counterparts. Smaller lungs mean poorer exercise capacity and greater vulnerability to respiratory symptoms and diseases. This is scary knowing that 40 per cent of urban children live in cities. “If this does not wake us up to the health emergency what will? Those who are on denial of environmental pollution-related deaths and illness in India should understand that the scary death tally and illness of Indians and children makes a mockery of India’s growth story. India will have to do drastically a lot more to reduce pollution exposure and not less of it. It will be criminal not to act on the mounting health evidences and ask for more evidences from our own children, elderly and vulnerable. Indian lung is not different from others,” says Anumita Roychowdhury, executive director, Research and Advocacy, Centre for Science and Environment. What's the need of the hour? Mandate all cities of India to implement clean air action plan in a time-bound manner and fix responsibility to meet clean air standards. Pollution hotspots like Delhi will have to implement emergency plan as per the graded response action plan to address health emergency. Quickly roll out comprehensive action plan for all sources of pollution in a time-bound manner for longer term action and systemic reforms for sustained air quality gains. Ensure paradigm shift in waste management to control waste burning, construction waste and crop waste. Delhi's air quality worsens, but does the city have a plan to avoid repeat of 2016?